Stoyan is an Italian painter from Bari, recently moved to London from Paris. We met on Bishopsgate, where I was tentatively setting up a light stand in the hope of meeting a stranger for my project. Timing was touch and go, having just finished a headshot session in Brick Lane, I had one eye on the last train. There were lots of great people about though, and it seemed a shame not to shoot with someone and keep the good momentum going. Stoyan in fact wandered up to me as I tried to suss out a background; he was out shooting some night shots of people handheld and was intrigued by the light stands I was erecting, all the while shooting along walls with the macro lens I’m shooting the project with. Explaining what I was doing, I immediately asked if he’d be interested in being my first subject. It’s always felt like cheating; asking photographers, and asking people that approach me, but he had a fantastically wild look. His scarf and hair had an edge of the Sahara, but a chic coat and shirt added a more refined element. Firstly, I’d note his immense patience. We shot for 30-40 minutes. Usually I have a background planned, but events here overtook me, so we tried a few angles and lines. Stoyan in fact suggested moving up to the gallery area off the street, conjuring this super set of diagonals. Stoyan had explained his painting was about human movement and emotion, and he demonstrated this in his posing. It was as if he was soaring, breathing in a high altitude wind. This shot doesn’t quite do it justice. It was fantastic to have someone bring so much of themselves, their character and imagination to a stranger shot. It made me realise that I often impose myself too much on subjects and restrict their expressing themselves. 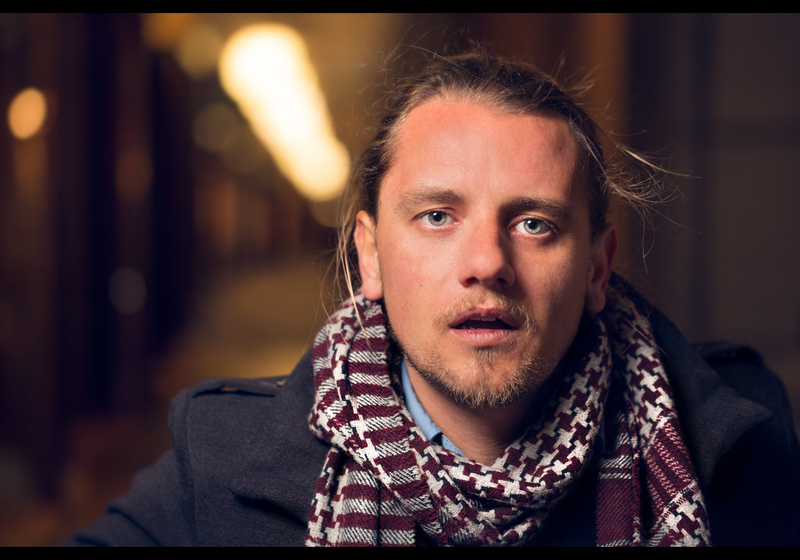 Stoyan is the second aritist I’ve been lucky enough to shoot, the first being Stranger #20/100, Tristan Ra. They’ve both been exceptional meetings, from which I’ve taken special learnings. So thank you Stoyan for your contributing so strongly to my journey through the project, and for being so generous with your time. I think you’d really enjoy the project yourself – so please do email if you’re interested in joining me and others some evening soon – it would be fantastic to have you along, on your more usual side of the lens! This is portrait #37 of my 100 Strangers Project – check out the group page and get involved. Canon 600EX-RT in 38″ softbox 45* camera left and up, fired at 1/64 power. Triggered by non-firing 600EX-RT on camera, used for focus assist.